You already know how to say hi, ask how are you, and say bye. You've picked a Spanish name. Now you're ready to learn how to ask someone what his or her name is, tell someone your name, and introduce one friend to another. Quiz yourself with the practice video. There are a few ways to tell someone your name. Let's go over two. Listen as Tomás and Rebeca meet each other. T: Bien, gracias. ¿Y tú? R: Mucho gusto. Soy Rebeca. R: Hi, how's it going? R: Nice to meet you. I'm Rebecca. If you offer your name "I'm ________", usually someone will tell you his or hers. What if you just get an 'okey'? You can always follow up with ¿Cómo te llamas? or ¿Cómo se llama usted? - "What's your name?". Even though it looks as if ¿Qué tal? requires an answer, it doesn't always. Just as in English, when you pass a friend and say, "Hey, how're you doing? ", you don't necessarily expect an answer, but you do expect at least a "hi." There are longer versions of qué tal -- qué tal estás, qué tal está tu familia, etc. People usually expect answers to those. But, lucky for you, the answer's usually just bien, gracias. 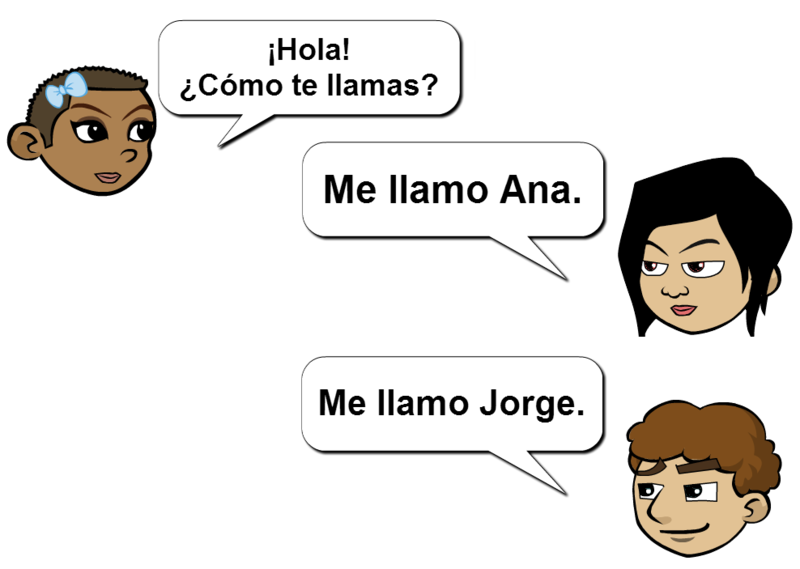 In an informal conversation, people will start with Hola and add something else. Examples, Hola, ¿qué tal? ("Hi, how's it going?") or Hola, ¿cómo estás?, or Hola, buenos días ("Hi, good morning"). If it's a really formal conversation (like a business setting), forget Hola and qué tal. Start with Buenos días (or buenas tardes / buenas noches), and then you can add on from there. For example, you could introduce yourself, or ask, "How are you?" - ¿Cómo está usted? Listen to la profesora and los estudiantes meet each other. Listen to el Señor Wáshington y el Señor César. Listen to Marta and Isabel. M: Bien, gracias. ¿Y tú? M: Soy Marta. ¿Cómo te llamas? M: ¿Quieres jugar al básquetbol? I: Hi, how're you doing? M: Fine, thanks. And you? M: I'm Marta. What's your name? I: Nice to meet you. M: Do you want to play basketball? Me llamo literally means I call myself. Me means myself and llamo means I call. ¿Cómo te llamas? literally means How do you call yourself? Two common ways to say "nice to meet you" are mucho gusto and encantado (if you're a boy) or encantada (if you're a girl). Encantado literally means charmed. That sounds awkward in English, in Spanish it's just being polite. To introduce one friend to another, you say, "Let me introduce you to [my friend]." In Spanish, you say Te presento a [mi amigo] or, more formally, Le presento a [mi amigo]. In these two dialogues, the kids say ¿y tú? because they're equals. They are both students and can use tú with one another. However, if it were two adults, you'd hear ¿y usted?, which means the same thing. Usted and tú both mean you. Watch as Señora Torres introduces her husband to her friend. These are adults who are meeting each other for the first time, so in Latin America it would be disrespectful for them to use tú with each other. Therefore, they call each other usted. When you talk with an older person, you should call him or her usted. To ask for his or her name, say ¿Cómo se llama usted?